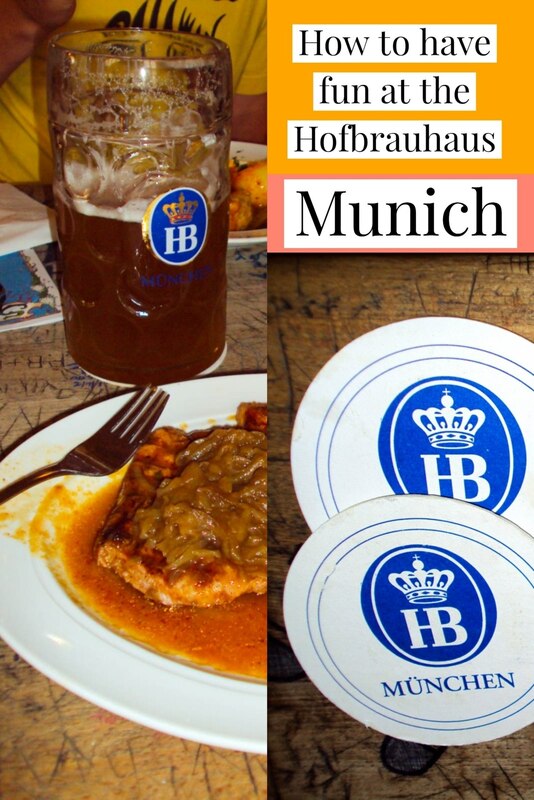 If you are visiting Germany, and even if you are not a beer drinker, you need to go to the Hofbräuhaus Munich. 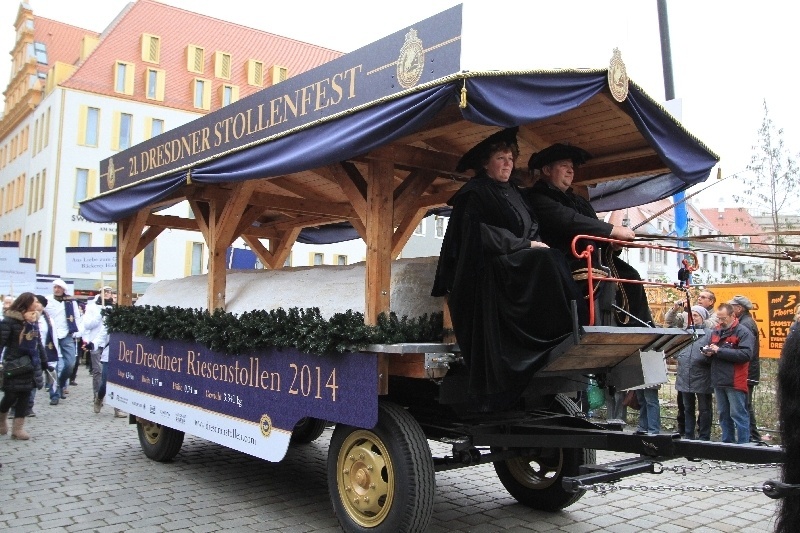 Outside of Oktoberfest season, it is probably the number one destination for tourists from all around the world. This large, loud, and bustling beer hall is open every day of the year and it is almost always packed. Here you get to do what we think you should do in Germany: drink great beer, eat delicious food, sing loudly, and clank large beer mugs together in friendship. 5. Who Else Has Visited the Hofbräuhaus? Have you been to the Hofbräuhaus? What was your experience? There is absolutely no doubt that at whatever time you enter the Hofbräuhaus, you will find tourists. Lots of them. The beer hall can seat 1300 people, and there are people there from all over the world. However, they are not all tourists, surprisingly the Hofbräuhaus had many regulars. Each time we visit, we meet interesting locals, and this last time we met Stephan who works in the city archives. He was an archive of information all on his own. Only having lived in Munich for the last seven years, he started visiting the Hofbräuhaus at least once a week right from the very start. Why? He said it was to meet people from all over the world. Since there is such an interest in the beer, the management has always catered to regulars. There are hundreds of people who have standing table reservations each week. There is even a list of them on the Hofbräuhaus website. Although most of the regulars are attached to a group, some are not and just come for the fun. 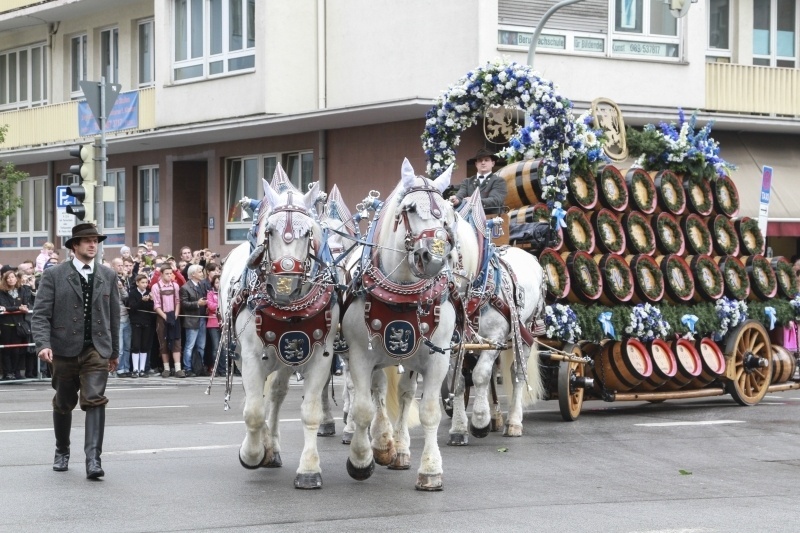 They will collect their tankard from a locker, order a maß (mass or beer-1 liter) which he will then pay for with a special Biermarke or token. 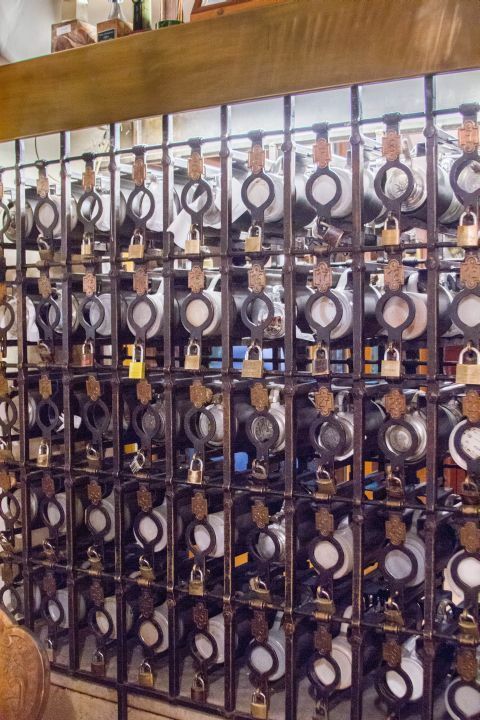 There are over 400 tankard lockers located around the main area of the beer hall, some of which have been handed down from generation to generation. However, like my friend Stephan, he was able to start renting his locker after being on the waiting list for just one year. I asked him if it was expensive to rent them and he said only a few Euros per month, but the waiting list has hundreds of people on it. He has a friend who has been waiting for four years. While we were sitting there, Stephan pulled out his Biermarke and paid for his beer. A Biermarke, or token, can be bought for a small discount per beer or you can buy ten tokens and get the eleventh beer free. For someone like Stephan, this saves considerable money over the course of a year. People have been going to the Hofbräuhaus for over 400 years since it first opened its doors in 1897. Many of the customs are old Bavarian customs, and even though there are plenty of tourists that go and do fine, you can have a much richer experience if you know how to do a few things. First of all, even though there are 1300 seats, you will walk in and the hall will seem completely packed. No tables are ever completely free. No problem. It is a German custom to ask if the empty spots at the table are taken. You can do this in English, but you can also ask like this? “Ist hier frei?” In this way, you can not only secure a spot, but you will get to know the other people at your table. I have met so many people by just plopping down in free seat and starting up some jovial conversation. Probably the most fun was the time when we went for lunch and ate with a German astronaut who had trained at NASA. You can always tell the locals by the trachtenmoden, or traditional Bavarian dress, that they are wearing. Before moving to Bavaria, I thought lederhosen and dirndl were only for tourists or restaurant workers, but I was wrong. 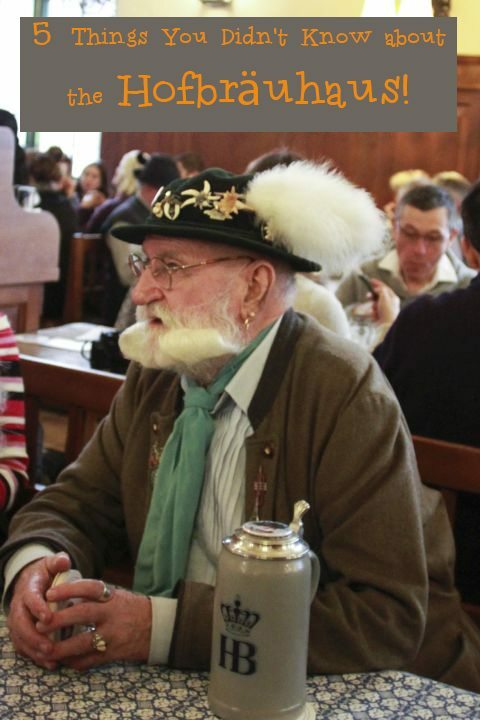 Many, many Bavarians own their own and proudly wear it for any number of occasions. You can buy the traditional felt hat and pins right there in the Hofbräuhaus, but as you walk around Munich you can also buy all kinds of traditional Bavarian clothes. One very important tradition that you should be ready for is singing. 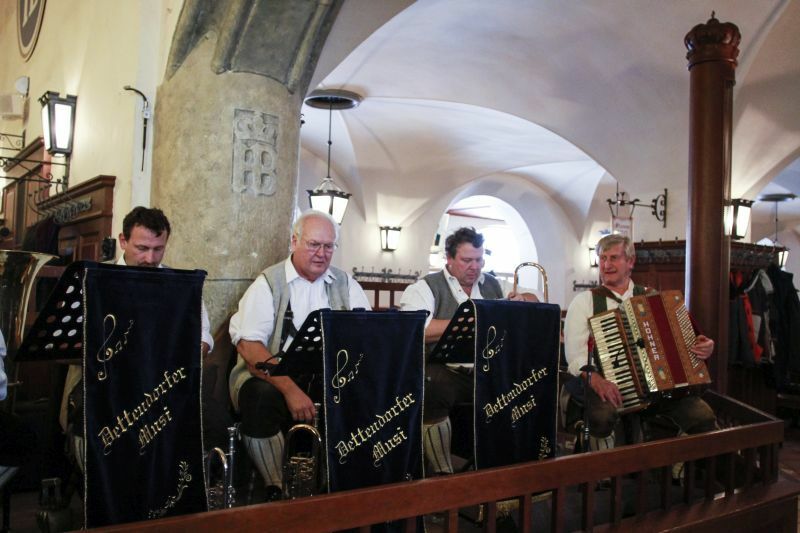 Every night a Bavarian band plays, and about every 15 or 20 minutes you can hear one or both of these songs: the “Hofbräuhaus Lied” (the Hofbräuhaus song) or “Prosit” (Cheers). Both give the visitors a chance to clink their beers with the person sitting next to them and have a toast. Don’t be shy! It is a lot of fun! And then yell! OANS! ZWOA! DREI! G’SUFFA! In München steht ein Hofbräuhaus: Eins, zwei, g’suffa! Note: I found these lyrics and more explanation at this website . 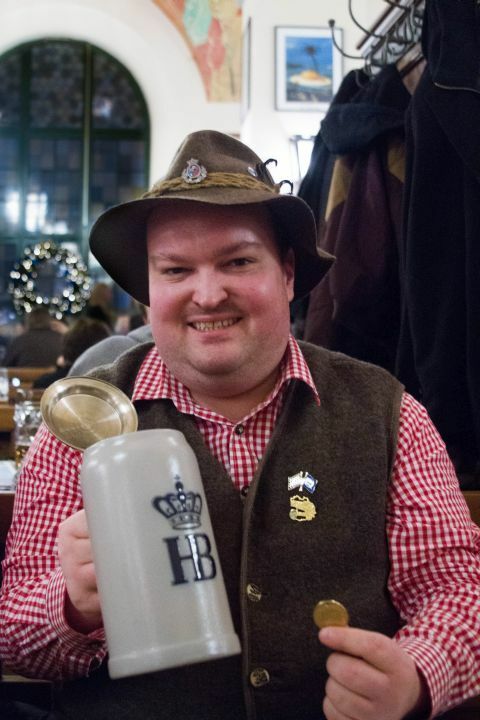 It’s no secret that Müncheners love their beer, and if you pay attention, you will see a short little brown-haired angel hanging around the Hofbräu beerhall. His name is Aloisius, and before he became an angel, he was a porter for the brewery and would end his day with a tankard. When he met his demise from working too hard, he went up to Heaven where he found that no beer existed. He was not happy about this and when the city government of Munich needed some Heavenly advice he volunteered for the job. He was sent down to help, but the draw of his beloved beer was too strong and he made a detour to the Hofbräuhaus where he can still have a tankard or two. Unfortunately for the city officials, they are still waiting for that heavenly advice to come their way. 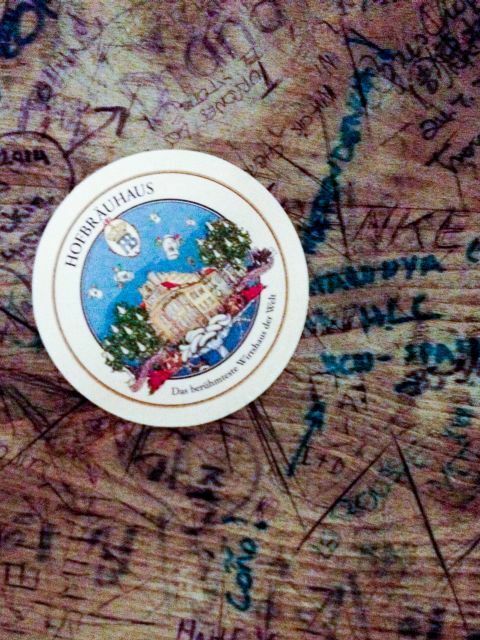 Some places you can spot Aloisius are the he Hofbräu beer tent at the Oktoberfest or on the deckels and coloring books at the Hofbräuhaus, so keep your eyes open and say a “prosit” to him while you are there. 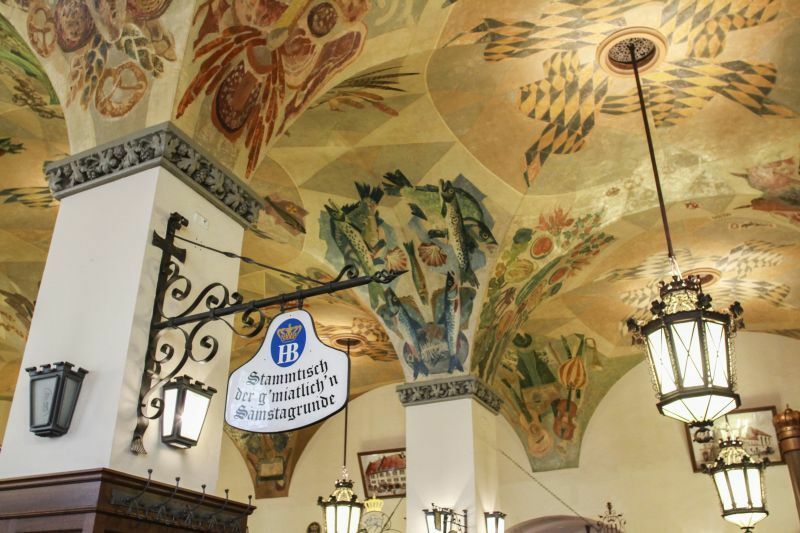 Due to its Gemütlichkeit, or feeling of comfort and coziness, many people have tried to replicate the Hofbräuhaus. Hong Kong has their very own Hofbräuhaus, as do five American cities: Newport (Kentucky), Las Vegas, Pittsburg, Chicago, and Cleveland. So even if you can’t get to Munich, maybe you can make it to one of these other taprooms. You can’t always eat at the Hofbrauhaus, there’s some other great places around it to try as well. Check out the Modern Bavarian Restaurant – The Pfistermühle. Pin the Hofbrauhaus for later! Shikha, Yes, getting to know the folks around you is really part of the experience, I think! I’ll certainly check out your article. These were all interesting to know! We went to Hofbrauhaus when we were in Munich and loved it. The kids were with us too. They loved walking around with those giant pretzels. It was so festive and loud. The food wasn’t bad either. Great to know about the special angel! Mary, I think the angel story is just cute, don’t you? Interesting. I have been three times, once back in high school (I was an exchange student in Germany) and then again when I toured right after uni and then we took the girls in 2012 as we went around the world. I am pretty sure Melissa had her first beer here, but possibly it was at the Munich Beer Garden. I never saw those locked up beer steins, pretty cool. Rhonda, Sounds like something to look forward to next time…and I’ll go with you! This is fascinating! Never mind things I do not know about the Hofbrauhaus, I did not even know what the Hofbrauhaus is before reading! Love the idea of having a personal tankard locker – though not sure I’d be patient enough to wait four years for one! Catherine, I don’t know. It’s pretty prestigious! Mike, The Hofbrauhaus never disappoints, and yes, the NASA astronaut was a highlight. Chanel, And you will always remember Germany partly because of that one experience…pretty cool! Interesting things to know, Corinne. I am not a beer drinker, but my husband is and I’ll share your article with him. If they serve some sausages with that beer, I’ll have those. Anda, Oh yes, there are sausages. It’s a fun evening at the Hofbrauhaus! I spent my 50th birthday in Munich. It was my 4th visit to the city. I was stationed in Germany from 88 to 91 and visited Munich 3 times. We landed in Munich on June 8th 2018 for a 2 week vacation and can’t wait to return, Munich is beautiful!!! Prost !!! JF Kennedy was there in his young days. He like many others tried to steel a beer mug but was cought and stpped by the staff.